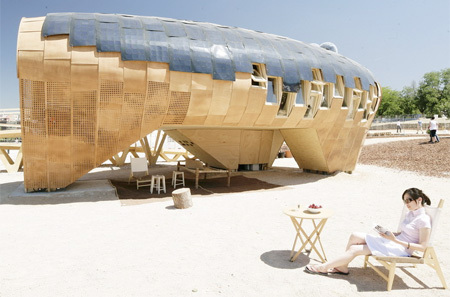 Creative wooden house designed by IAAC is equipped with solar panels that convert sunlight into electricity. 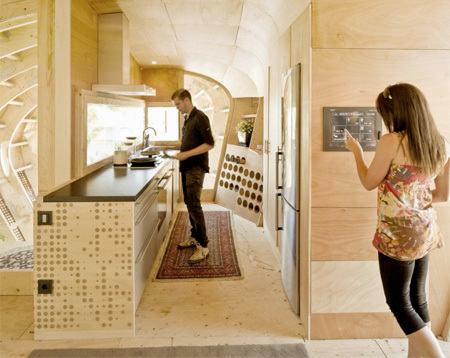 Fab Lab house generates more than twice the energy it needs to function. Interior furniture and the house itself was constructed out of wood. Beautiful, especially the bedroom and kitchen. Changing between the indoor and outdoor views, I do wonder if it’s as spacious as it looks. With no or few straight lines to speak of, it’s hard to tell whether they used a wide angle lens to make the inside space look bigger. 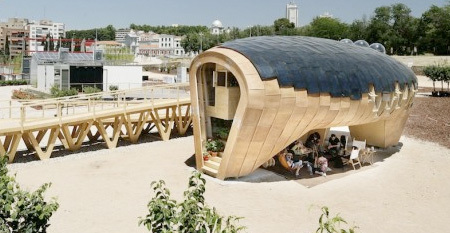 It’s beautiful, but using so much wood isn’t precisely environmentally friendly nowadays. 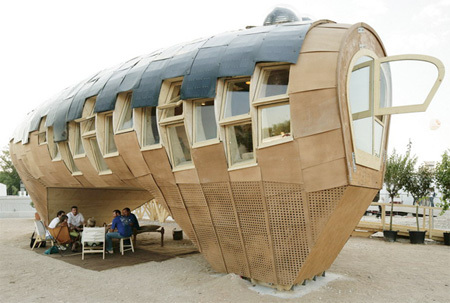 nice concept, but this is the Ugliest piece of architecture i have ever seen….! @Jessica… isn’t wood the totally environmentally friendly way to build… considering it grows in trees, which are a renewable resource? Ah, there’s no insulation. If this is in Europe or the north half of North America, you’d freeze in the winter, even though the furnace’d be heating the great outdoors. It’s like a big ottoman. Unique design perhaps but i doubt if it will be stable enough to withstand a stiff wind. I immediately notice a few things. First and foremost a total lack of insulation, this is no problem if you live in a place where the temperature is the same year round, but most of the world is not that kind of place. 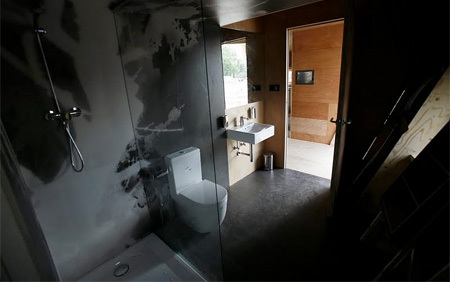 The second thing is the total lack of ventilation except natural ventilation, again all well and good in the right spots but for most of the world worthless or even downright lethal. Same thing goes for the lack of heating or air conditioning. The only major appliances I see are a fridge/freezer, what appears to be a stove, and a smarthouse computer system that must be bored to death by having nothing to manage really. Other than that it looks good, metaphorically anyway, aesthetically it reminds me of something from the bad end of the cow pen. Probably shouldn’t smoke inside either. I’m sure it’s built to, you know, STORE the energy. Unless it rains 40 days and 40 nights, that I duno. I think it’s tough. 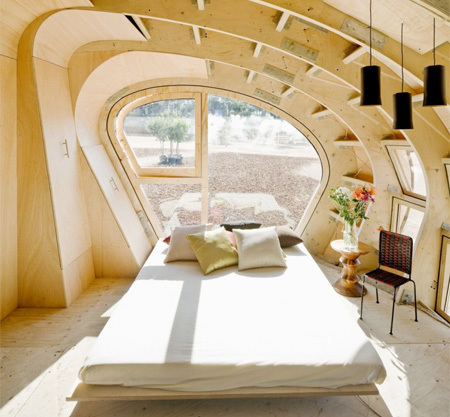 I’d live in it in a heartbeat. I’m sure there is some sort of insulation or it wouldn’t fall into the energy efficient category but what kind is it? 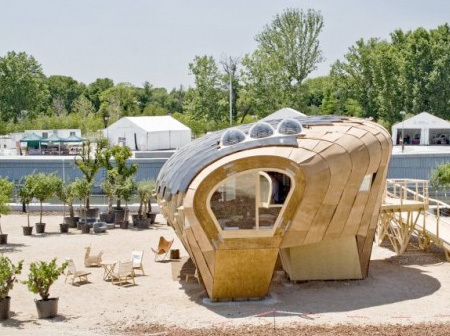 I’d like to know in case I ever decide to build a funky little solar house. My first thought was ‘ugly’ but after reading the other comments I’m adding impractical as well. Wow, so many people complaining about an apparent lack of insulation. Just because a material is thin, doesn’t mean it’s flimsey or lets in a draft. For a given thickness, plywood boards (as in criss-crossed layers of thin wood veneers, not particle board) is muuuch stronger, more flexible, and more insulating than any sort of metal, plastic, concrete, or stucco (the stucco on most cheap track homes can be completely chipped off with no more than a fingernail). And it looks like those beautiful waffled recesses in outer walls and ceiling are about a foot deep, so if you were really obsessed with insulation, that’s about 6 more inches of space you could fill in with foam than in the average house. 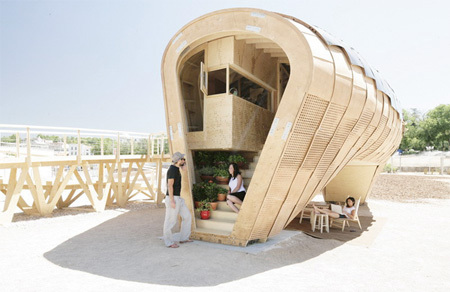 Also, raised houses have a certain degree of natural insulation from their shape. In the summer, it’s got a pocket of cool, shaded air beneath it. In the winter, when there might be frost or snow on the ground, the whole bottom surface of the house is not sitting right in it, right at the level of the freezing water table. A raised floor makes the wiring for heated floors much simpler and easier to maintain as well.